It’s fitting that a novel that’s meant to be a comment on the emptiness of wealth, the decline of the American dream, and the ultimate unattainability of dreams could be converted into a film that’s so superficial and so obsessed with its own image. That’s a backhanded compliment though because, in spite of the glamour, the beauty, the (mostly) faithful interpretation of the original source material, Jack Clayton’s 1974 version of The Great Gatsby fails to capture the essence and nuances of Fitzgerald’s classic novel. The novel’s events are all present and correct but Clayton – and by extension leads Robert Redford, Mia Farrow and Sam Waterston – fail to convey any of Fitzgerald’s feeling or the beauty and meanings of his prose. At the time of the film’s release, Vincent Canby at the New York Times observed: ‘Francis Ford Coppola [screenwriter]… and Jack Clayton… have treated the book as if it were an illustrated encyclopaedia of the manners and morals of the nineteen-twenties instead of a short, elegiacal romantic novel’. By focusing on events, ‘history’ perhaps, and the literal visualisation of Fitzgerald’s motifs (the green light at the end of the dock, or Doctor T. J. Eckleburg’s all-seeing eyes for example) Coppola and Clayton manage to completely overlook most of the finer points. The events to which they are so ruthlessly beholden were, under Fitzgerald’s skill, a narrative device (after all, a novel has to be filled with something) that enabled the author to make a much wider comment on society. In the original novel, Daisy and Gatsby’s love affair might be the central idea, but it’s part of a wider thought – the broken heart belongs not to Gatsby but to Fitzgerald. Reducing the film to a cookie cutout love story was a mistake; the audience is invited to engage with characters and events but is never fully immersed in them. Production designer John Box and costume designer Theoni V. Aldredge suffer from the same literal blindness. Although there are fewer allusions to surrounds and costumes in the source material there are enough to imagine ‘the Gatsby era’ as the author did. That’s not to say the film isn’t visually stunning – it is. Yet in spite of the visual dazzle – or perhaps because of it – the imagery, clothes and styling also fail to encapsulate anything that’s truly ‘Fitzgerald’. It’s a paint-by-numbers view of the Jazz Age, viewed through the lens of the 1970s. I should note that this clearly was not an opinion shared by the Academy. Aldredge won an Oscar (and a BAFTA) for Best Costume Design (beating Chinatown and Daisy Miller among others) and Box received the BAFTA for Best Art Direction. Watching the film, it’s the costumes and production that make the (almost) 2.5-hour film bearable (as Roger Ebert notes, it takes as much time to watch Gatsby as it does to read it; the latter is an immeasurably preferable experience). And perhaps that shameless, empty and frivolous experience is in keeping with the novel’s original ethos. Daisy, Tom and Gatsby are obsessed by what they own and consume, by who they are and the illusion(s) they project. It’s only natural that a film that’s so obviously about image should be ostentatious itself. Again, as with the screenplay and direction, there’s nothing to back up this show of superficiality. What’s behind those T-bar clad shoes dancing the Charleston to perfection? Not a lot. In Aldredge’s defence, she was hired just a fortnight before shooting began (a last minute change of producers forced Clayton to find a new costume designer). The schedule – already fixed – meant she had just two months to prepare for the party sequence. Considering that, the entire wardrobe is nothing short of a miracle. In terms of costume, it starts promisingly enough. 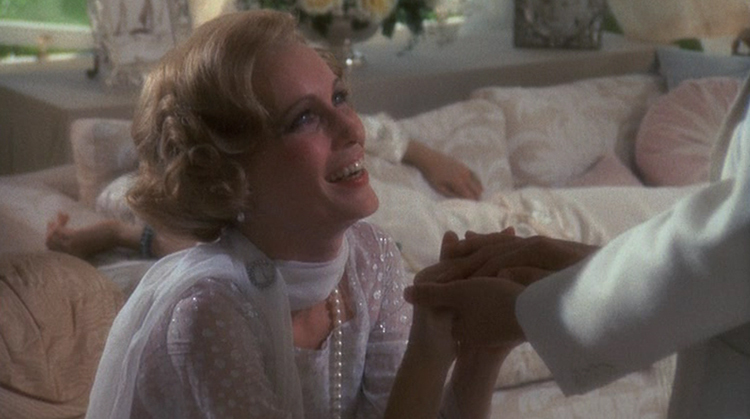 In the novel, Fitzgerald introduces Daisy Buchanan (played by Mia Farrow) and Jordan Baker (Lois Chiles): ‘they were both in white, and their dresses were rippling and fluttering’. White displays wealth. The movement of the dresses highlights their inaction, the fact that they can recline on sofas all day in the full heat of summer. As Aldredge observed: ‘everything worn by the main character is white to pale, pale lavender. Rich people did not get soiled, and they didn’t care, they thought they could throw it all away.’ Yet this carelessness – of possessions and other people – is never fully conveyed. Daisy’s clothes wear her. She needs them to create her character because her own sense of self (or Mia Farrow’s sense of her) isn’t strongly defined. She clings to her material trappings, but there’s no indication why she needs to construct her identity through them. Of course, the attention to (costume) detail is wonderful. Aldredge again: ‘All of Daisy’s gowns will be memory pieces, beaded to look like daises. She will flutter and be frail. She is a Southern belle who looks pretty, has no whims, can’t boil an egg or heat up coffee.’ However, the overall effect is too fussy, too fanciful – reducing Daisy to a ‘romantic’ type figure diminishes the many other facets of her character. She’s also empty, naïve, selfish, indecisive – a love-hate character that’s reduced – in Clayton’s film – to little more than the clothes she wears. The masculine-inspired wardrobe favoured by golfer Jordan Baker is much more convincing. Not only have the androgynous silhouettes (no doubt inspired by Coco Chanel) and graphic patterns aged better, they say something more about her character (even if Lois Chiles doesn’t make much of an impression) and exemplify her sporty independent spirit. That’s not to say it’s not difficult to get a handle on Jordan – is she arrogant? dishonest? comically blunt? – but she certainly feels less elusive. The Great Gatsby is one of those rare films where the men’s costumes are just as important as the women’s. Created by Aldredge in collaboration with fashion designer Ralph Lauren (apparently the partnership – and exactly who got credit for what – was a source of contention. Aldredge was adamant that Lauren only provided tailoring and some shirts; tellingly she fails to mention him in her Oscar acceptance speech) they generated quite a buzz. The standout look is Gatsby’s pink suit, an outfit that – according to Tom Buchnan – proves he is no way an ‘Oxford’ man. It is ostentatious and showy – all the more so when executed in a white-buttoned, wide-lapeled three piece, and styled with a crisp white-collared shirt and shoes. Just like Gatsby’s yellow car, it’s worn for show – the chance to display his wealth and status. Any costume analysis of The Great Gatsby really has to consider the shirt throwing scene, when Daisy realises that Gatsby is (or has become) the successful/wealthy/privileged man she wanted him to be when she first fell in love with him. That she missed her chance for happiness because she looked down on his poverty. It’s his opportunity to prove he is – and was – deserving of her love, but that now perhaps she isn’t worthy of everything he created in his effort to impress her. The mirrored doors of Gatsby’s dressing room wardrobes reflect the character’s images back on themselves, showing Daisy marooned in a sea of crumpled shirts. It’s a visually harmonious images as the discarded fabrics are so similar to her lavender chiffon dress, and a successful (if unsubtle) cue that they could have been happy together. Here, as in so much of Clayton’s film, there’s a lack of depth to the performances. Daisy might show emotion, but we’re not convinced she’s really feeling it. Her tears are as shallow as his conspicuous consumption. It’s not Theoni V. Aldredge’s fault that The Great Gatsby doesn’t work. Considered as standalone costumes, they’re actually wonderful, but when viewed within the context of the film they only heighten its flaws. Maybe it’s simply that the ‘Great American Novel’ doesn’t translate to screen. Coppola certainly claimed that his script was significantly altered during filming – it would be interesting to know how he would’ve directed it, given the chance. It’s also possible that the novel – indeed the author – is one I personally hold too close to my heart to view with any kind of objectivity. But any adaptation that fails to incorporate one of the most famous closing lines in literary history really needs to take a long hard look in the mirror. This post is part of the 31 Days of Oscar blogathon, hosted by Paula’s Cinema Club, Outspoken and Freckled and Once Upon a Screen. Running throughout February, each week will examine a different facet of the Oscars. Catch up on all the wonderful entries here. Great assessment, Miss V! The costumes were marvelous but the style and no substance –are we talking about the 1974 film or the 2013, for they both suffer from promising fizz but fall flat on character immersion. Your question whether the great American novel can be duplicated on screen is a good one. I’ve only seen Steinbeck adaptations to the screen come close. For example, East of Eden and Of Mice and Men directed by Gary Sinese. I agree – both are disappointing, although Leo elevates the most recent version for me 🙂 And you’re right about Steinbeck, East of Eden is a great adaptation, and I thought John Ford’s Grapes of Wrath effort was fairly decent, although despite getting the characters ‘right’ that too missed some of the atmosphere of the era. Although I wasn’t alive during them, so perhaps I’m comparing my idealised version to how it ‘really’ was! I agree with you 100%. While gorgeous to view, the film totally missed the greatness of the novel. The latest Gatsby was, for me, much more satisfying. While the film was a bit over the top, Leo Di Caprio was a Great Gatsby. Leo is a great anything 😉 Whilst the latter version is much better a capturing the era, I was so distracted by the soundtrack (what were they thinking?!) that I think it undermined the entire experience. I’ve never understood why directors thought it possible to adapt this book to the screen. It’s just not plot driven enough; it’s all about the language, and both adaptations made the mistake of falling for the trappings of the book rather than its meaning. It’s not surprising the costumes do the same. I’ll admit that I went to see Luhrmann’s in order to make fun of it (after the promise of campy Australia), and part of it was indeed as laughable as I’d hoped (Nick as a surrogate for Fitzgerald???). It did have one really good scene thanks to DiCaprio (right before meeting Daisy). But neither director chose an actress capable of capturing Daisy’s selfishness fully. Yes I thought a bit about Daisy while I was writing this but I didn’t go into it in the post. It’s almost like actresses are scared to play a character that’s unlikeable through selfishness/self interest/self absorption – of course, there are other unlikeable female roles for other reasons, but Daisy always seems to pose a problem. In the end, so much of the conclusion is driven by her (in)action, but in both films her character is too diluted to make that point. I love watching this film for the costumes and sets, and for that fabulous shirt-tossing scene. But Robert Redford never really convinces me he’s Jay Gatsby and, although Mia Farrow is stunning, I’m not quite sure what Redford sees in her. I do like the supporting cast but, having said all that, I agree that the film comes nowhere close to Fitzgerald’s beautiful narrative. That’s my favourite scene (great minds think alike!) and the only one that comes close to capturing the essence of Fitzgerald – perhaps because it’s so action driven it gave the emotion/the actors a more tangible framework to work with. I’ve never been sure about Redford in this role, I always thought I came a bit too late to the party to appreciate him, but maybe he was just mis-cast! Yeah, I am kinda on board with the other posters and yourself on this one. When you read Gatsby (and I read it last just a few months ago), I can see where a filmmaker could be lulled by it. It lends itself easily to the externals – The hair, the clothes, the cars, the houses – But the skeleton of the story is pretty elusive. I am still not convinced it can’t be filmed effectively, however. I’ve read it again and again, it’s one of my favourites. I thought that was why I judged both film adaptations harshly so it’s interesting to see that I’m actually not in the minority. So much of the beauty lies in the imagery and Fitz’s use of language, and part of me is convinced that never will translate to anything other than an art house film. But I’d still like someone to prove me wrong! Great Analysis on the costumes. I love the book. It’s practically impossible to translate onto the screen. Thank you 🙂 I think with the number of adaptations that have failed it’s unlikely anyone else will try. I’d be interested to see new adaptations of Tender Is The Night or The Beautiful and Damned. The costumes are about the only decent thing in the film. To be honest, I have only ever gotten about halfway through this film before turning it off; it’s too lifeless to sustain interest. I think I might have judged them a bit too harshly – it’s an impressive job considering how little time she had to prepare. That said, I could’ve done without the 70s flair 😉 I had to force myself to watch this the whole way through (the things you do for research!) but ‘lifeless’ is a great descriptor. I’d also like to offer insipid!